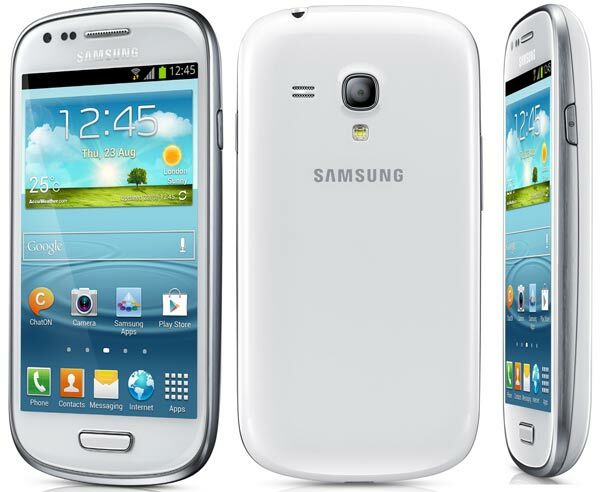 The Samsung Galaxy S3 Mini is the newest addition to the catalog of the Korean company Samsung . With the launch of this handset, the Korean company expands its family of devices with an entry level smartphone, but equipped with all the technical features and functions that we would ask a smart phone today. His appearance, you see, is very similar to the Samsung Galaxy S3 already submitted a few months and has become the pinnacle in technology within Samsung and probably in the sector. No wonder the South Korean company has become the undisputed leader of the mobile phone market in general and smart phones in particular. His appearance, compact and ergonomic, is offered as an elegant economic proposal, within the wide range of devices with Android . In fact, you can buy those with no intention of spending all their savings on a Samsung Galaxy S3, but are interested in the pocket carry Samsung technology. Their four-inch screen and dual core processor are clear indicators that this is a ready and interesting phone for a very important sector of users. Below, we provide a thorough analysis with photos and reviews that will help in the final selection of your new terminal. Will it be a Samsung Galaxy S3 Mini? Here we go! 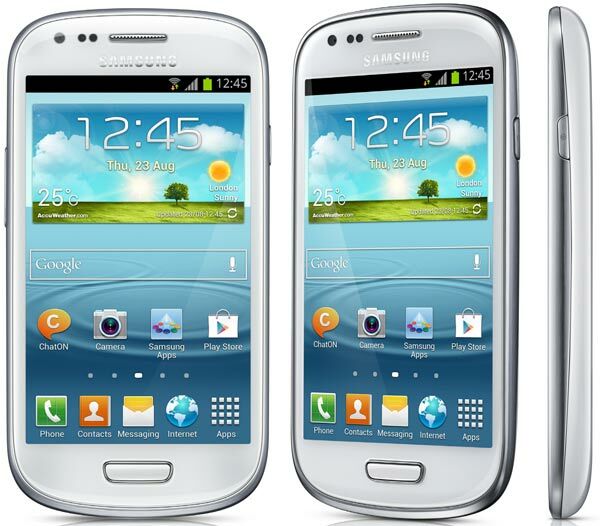 The Samsung Galaxy S3 Mini has dimensions significantly smaller than its big brother, the Samsung Galaxy S3: 121.55 x 63 x 9.85 mm. The most striking difference, however, is based on weight. It aims 115.5 grams compared to 133 which is the current flagship of the Korean battery included. But let the other important issues. The design, as you could see, is closely linked to the new philosophy of Samsung, as their forms and their external architecture is very similar to the latest devices presented from the Samsung Galaxy S3 inaugurated this new trend. We also refer, of course, the Samsung Galaxy Note 2 that was presented a few days ago and it follows in the footsteps of that terminal. It comes in one color, white, although it would not be surprising that in the next few days we knew a new piece in black or blue. It features a four-inch (diagonal) having dimensions much smaller than the top end. In any case, we have a panel that works with Super AMOLED technology and boasts a WVGA resolution of 480 x 800 pixels. Has a density of 233 pixels per inch and a depth of 16 million colors, as usual in such cases. For the occasion, it seems that Samsung has not mounted on the glass no layer of protection that can help save scratches, accidental bumps and scratches. Do not forget, in any case, that the materials used by Samsung and are of high quality, which is not at all makes us fear for the integrity of the device in any involuntary fall. 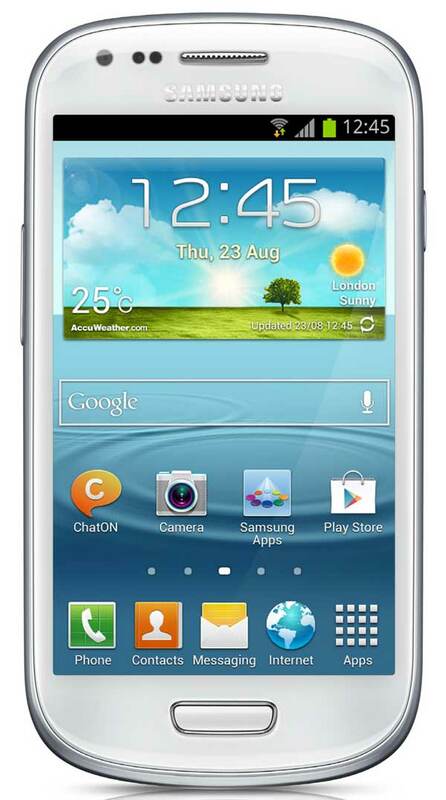 The Samsung Galaxy S3 Mini is a phone ready for connectivity. To begin, we must say that it operates on HSPA 14.5 / 5.76 900/1900/2100 and EDGE / GPRS 850/900/1800/1900. Is guaranteed in principle 3G connectivity with HSDPA transfer rates of 14.4 Mbps and HSUPA 5.76 Mbps. Incorporates also connectivity through wireless technology 802.11 a / ​​b / g / n, which allow users access to any available wireless network in your workplace, at home or in any space with Wifi enabled. Additionally, users can enjoy this phone and Wifi Hotspot Wifi Direct, indispensable tools for data transfer, plus support for Bluetooth 4.0 with A2DP and EDR. How could it be otherwise, Samsung wanted to give this Samsung Galaxy S3 Mini a chip NFC (Near Field Communication) that allow customers to start enjoying this technology for short-range communications. In the field of navigation, users can rest easy: the phone has GPS with aGPS support and GLONASS, useful for geolocation services and how not to build routes and use the phone as a navigator in our driving routes. In the section on physical connections, the user must have an entry MicroUSB 2.0 we will bead for synchronizing files or even battery power, with an output of 3.5 millimeter headphone jack and a card slot microSD. This last provision helps to expand the memory of the device in the event that we do not have sufficient user memory proposal. The camera complies with what we would ask a basic end smartphone. No more than eight megapixel Samsung Galaxy S3, but remains in the five, which is not bad. Not at all. Users can take snapshots of quality at a maximum resolution of 2,592 x 1,944 pixels, enhanced with some interesting additions such as the geotiquetado, autofocus, face chaser or LED flash, useful to the extent that it is getting dark or at the moment we are in too dark scenarios. Furthermore, we shall shoot video in high definition, although not full HD, 720p @ 30fps, which is not bad. A secondary VGA camera enhance our experience. It is located on the front and just to take pictures, we will great for video calls, if you are a regular of this mode of communication. As good smartphone today, the Samsung Galaxy S3 Mini is also perfectly suitable for media playback. Specifically music, video and photos in major formats. As indicated in the official sheet, are: H.264, MPEG-4, H.263, VC-1, SorensonSpark, WMV7, WMV8, MP3, AMR-NB, AAC / AAC + / eAAC +, WMA, OGG (Vorbis), FLAC. Moreover, those who love this kind of content will have the opportunity to distribute your photos, videos, games, videos and books through various Hubs, specially authorized for this purpose. Finally, it is noted that the phone has FM Radio with RDS, support JAVA and Adobe Flash Player 10.1, languages ​​running on many applications and games for mobile. And let one of the most important parts of the analysis: the terminal heart. This time, Samsung has refused to provide their offspring with a processor as powerful as the quad-core Exynos carrying the Samsung Galaxy S3. The Samsung Galaxy S3 Mini incorporates a processor with a dual-core architecture, a U8420 NovaThor operating with a clock frequency of 1.5 GHz. Performance of this piece combined with a 1 GB RAM, wide enough to provide a good experience aboard this terminal, both when running applications such as performing the main tasks of the operating system. And speaking of OS. How could it be otherwise, the company has selected Samsung Android and has done in the latest version is known and already being installed on devices that have been presented recently. This is the edition 4.1 Jelly Bean, though it is likely that in the coming months, users can enjoy higher. In this case, it must be said, the system comes topped with TouchWiz interface, a classic in Samsung products that will make the user feel more familiar with the environment. Logically, this Android phone users will have direct access to all Google services, including the App Store, which can download dozens of applications to extend and improve the functions of the terminal. Applications will be available as standard: Google Search, Google Maps, Gmail, Google Latitude, Google Play Store, Google Play Store, Google Play Books, Movies Play Google, Google Plus, YouTube, Google Talk, Google Places, Google Navigation, Google Downloads . Finally, I must say that the phone is available in two different versions: one 8 GB and a 16 GB that the user can choose from depending on your specific needs. In any case, and provided that no adequate space, we shall expand with microSD memory cards up to 32 GB. 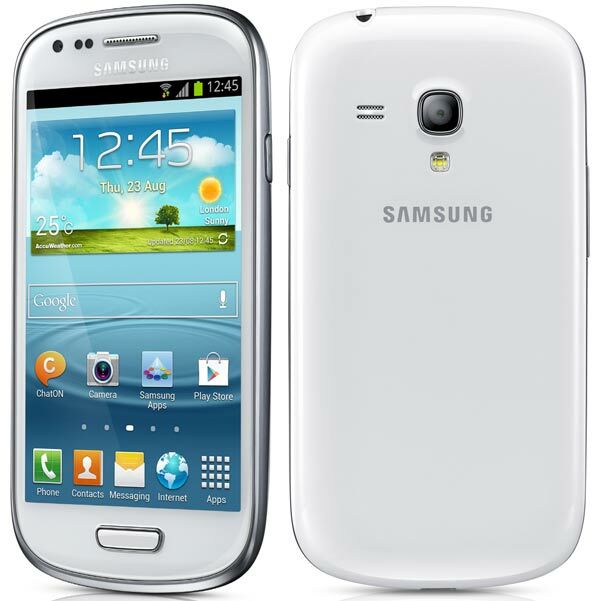 The Samsung Galaxy S3 Mini presents the market with a lithium ion battery with a capacity of 1,500 milliamps. This is a discrete amount, but enough - at the discretion of Samsung - to offer enough performance to terminal solvent. Keep in mind, however, that important factors such as connectivity, location services, the network status and the own users make use of the device may seriously affect the battery life of the device. As always, if you do not want to waste energy in vain have to go disabling all those services that do not use and pay attention to all the functions that can be active and which are not vital. Logically, there are external solutions as spare batteries, car chargers and USB cables to save the battery of our terminal at any time of trouble. Everything suggests that the phone will be available to customers within very little Spanish. It is expected that within a few weeks we have it in the catalog - and in the store - from Samsung to acquire in free format, but also offers subsidized or using operators normally offer their customers more loyal. Everything will look. 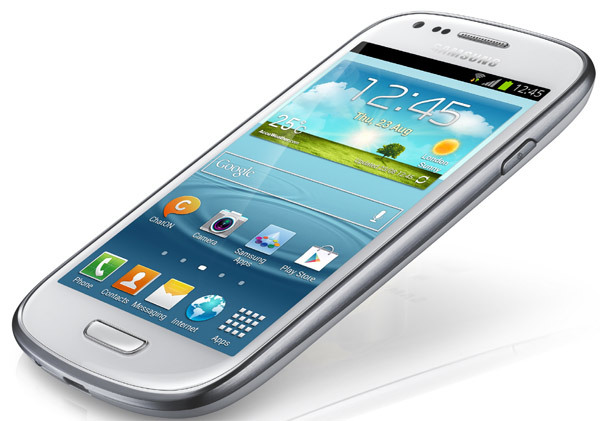 For now we can say that the Samsung Galaxy S3 Mini will cost approximately 400 euros free. We look forward to communicate any details of his official coming-out, exact dates, prices and availabilities with the various operators in the country.